The much awaited results of the Philippines professional examination are expected to be released on Thursday, March 26, 2015, according to some news site and blogs. 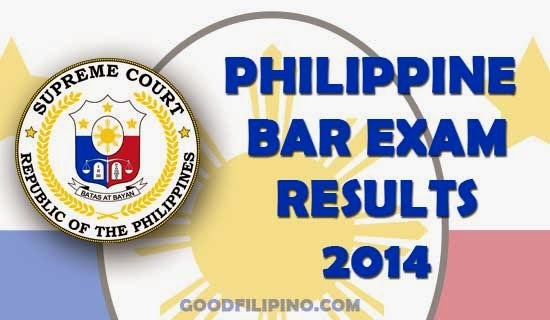 October 2014 Bar Exam Results are now displayed on this page, the Supreme Court released it online. Last October 2014, Philippine Bar Exam was held in 4 Sundays at the University of Sto Tomas that caters a total of 6,344 law students who took the most difficult professional exam in the country. But the 113th bar examinees have a confirmed initial list of 6,344 on the first day, then on the next day, a total of 350 law students had decided to back out. The Philippine Bar Examination covers eight law subjects that have been administered by the assigned Supreme Court officials. It was traditional rule since 1900. The 2014 committee on Bar examination is none other than Hon. DIOSDADO M. PERALTA. Comments or suggestions about "October 2014 Bar Exam Results of the Philippines Released (March 2015)" is important to us, you may share it by using the comment box below.